This runner was crazy easy to make–a fabric sandwich edged with bias tape. Sadly, I couldn’t be bothered with photographing each step because as I was sewing, I was binge-listening to all 12 of the Serial podcasts. (Which further illustrates just how beautifully mindless this project is: you can devote your whole brain to murder courtroom drama while you work). Materials: 1 yard cotton canvas (this print is from the Outside Oslo Collection by Jessica Jones), 2 packages of extra wide, double fold bias tape (3 yards in each package), matching thread. 1. Cut two rectangles to desired length (mine were 55″ long, the width of the canvas). 2. Sandwich the two pieces, bad sides together and sew a 1/4″ seam allowance along each side. 3. Sew on bias tape. As a self-taught seamstress, I didn’t go to bias tape school so I followed these helpful directions from oliver + s.
That’s it. As I mentioned, it’s so simple, you can annex your mind toward more worthy goals, like gobbling up whodunit podcasts. In the end I went with the less-gravity-defying version: Ben Moore’s pale elephant pink on top, Moore’s italiano rose for the legs, and a light brush of poly. I’m pleased–it’s adding some color to my winter days! 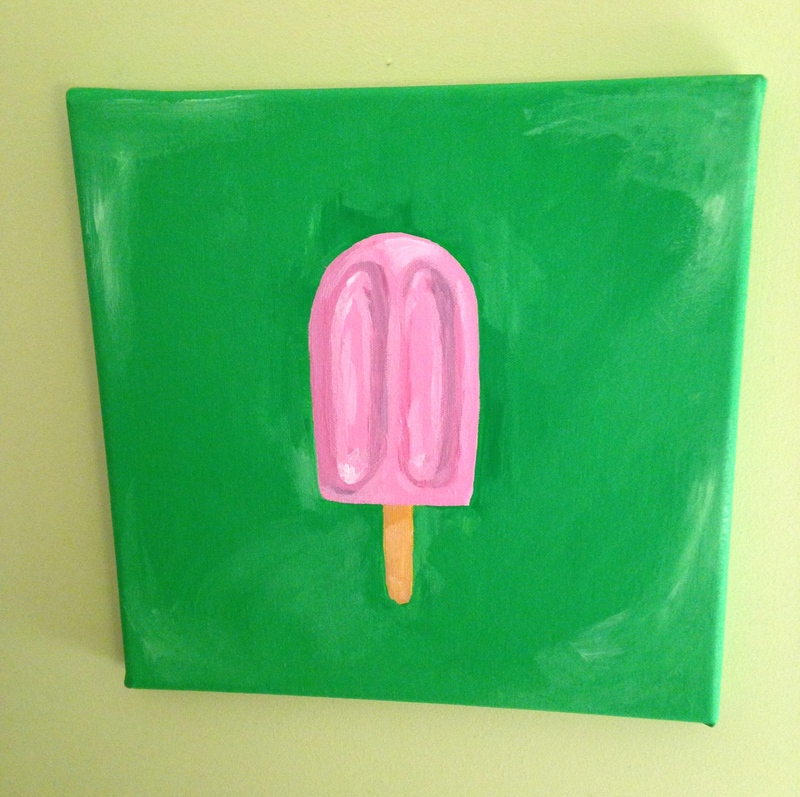 How to explain this pink popsicle painting? First, a confession: I’ve spent an evening or two watching sitcoms with my teenage son. OK, that’s an understatement. Maybe we’ve binged on a few seasons of New Girl, and even though it’s an amusing enough show, sometimes the mind wanders . 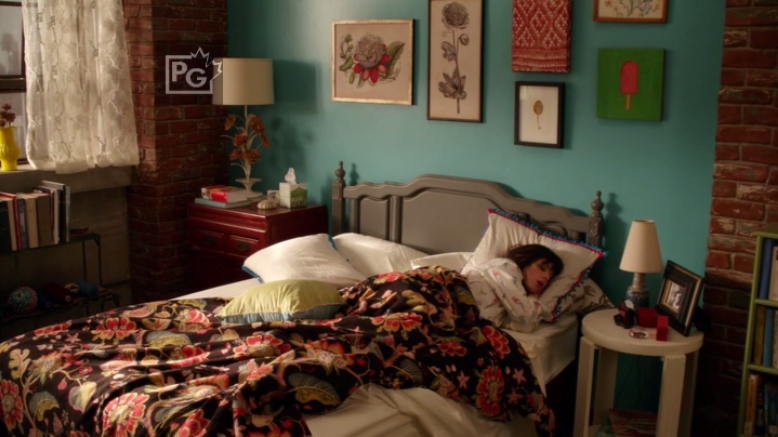 . . hey, what’s that on the wall behind Zooey Deschanel’s bed? 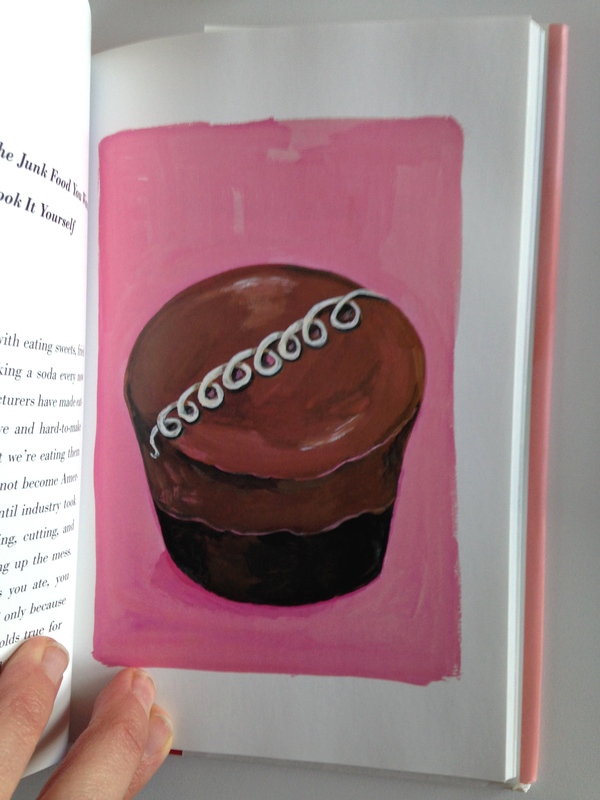 I’m also a fan of Maira Kalman, master of the Hostess cupcake still life (among many other beautiful paintings, all of which are painted with a frosting of delicious color). It couldn’t be too hard to do, right? Well, it’s been a while since I’ve painted anything, and I was a little stiff about moving paint around. Also, how exactly does Maira make her paint look so edible? I used acrylic paint (a practical option when painting where you live and breathe) but lacking in gloss. So, I’m going to apply some varnish and hope that gives it a little sparkle and shine . . . that is, when I get around to it. Thanksgiving approaches, and with it, thoughts of a long, sumptuous meal set on a beautiful table. Notice I didn’t say, “thoughts of planning and preparing a meal.” Are you kidding? I wouldn’t be rhapsodizing if work were involved. 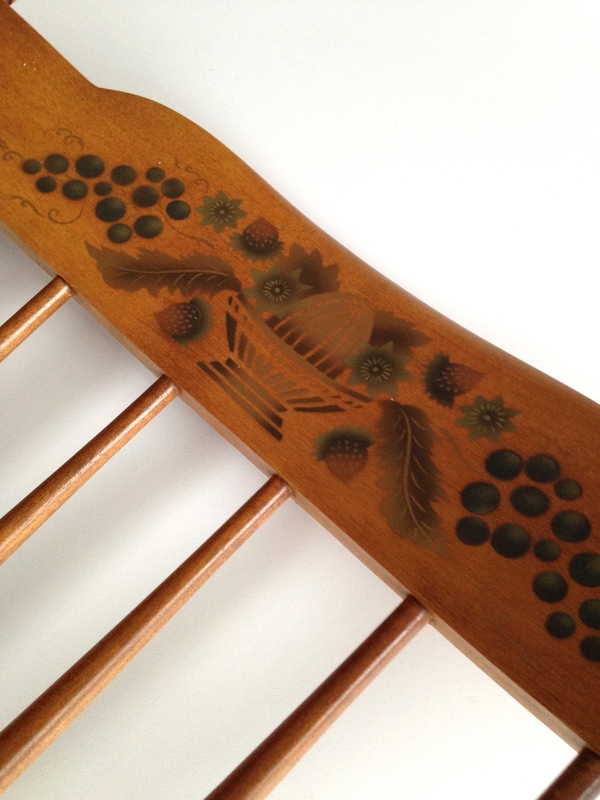 But if you’re up to it, here are some great projects to inspire your Thanksgiving table. You get the idea. 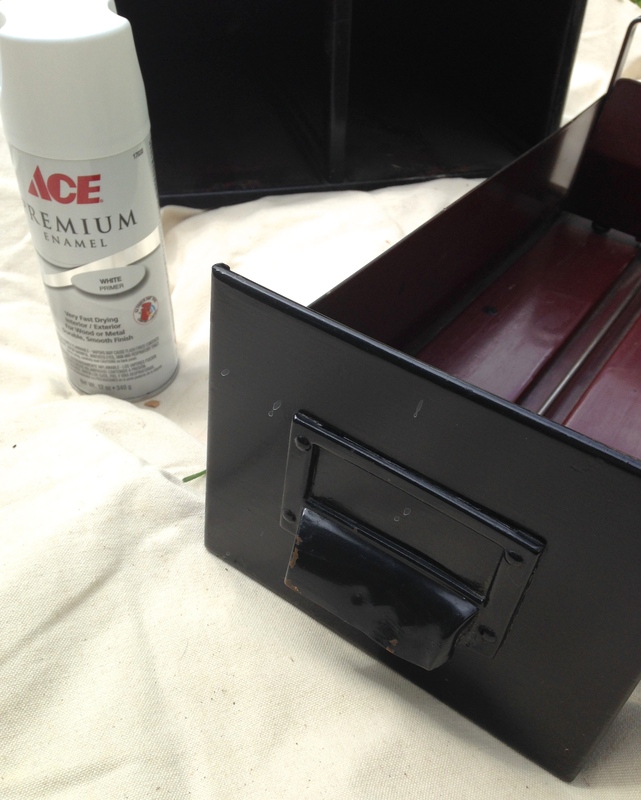 Vintage black card file drawers. Actually, I think they were originally army green, and I painted them black a while ago when my husband and I were going through a “drag any old discarded file cabinet off the sidewalk” phase. Does everyone go through this phase? Is it developmental? It’s definitely a pre-kids condition. 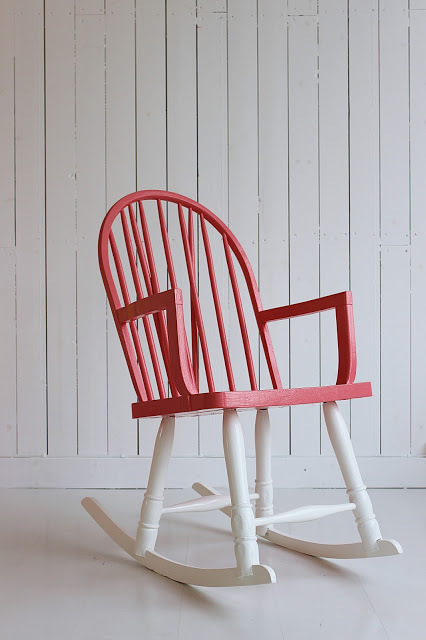 Anyway, I was inspired by this Land of Nod item to dig the old thing out of the closet and give it some new paint. After spraying the file drawers with enamel white paint (and then laying down for a while due to resulting asphyxiation), I got to work on the fun part. 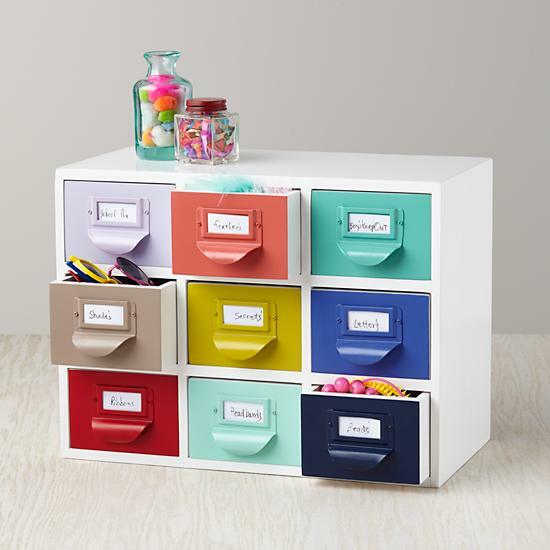 I used tiny bottles of model paint to color the drawer fronts. I don’t know if you can tell but there are actually two different file boxes with two file drawers each. The top box is made of wood, the bottom of metal. They sit on top of each other nicely though, and their differences add to a general funkiness, I think. I haven’t quite figured out where to put the drawers–they are 17″ deep!